Common Causes of Gum Disease Make Your Smile Dazzling For Your Wedding! Remember all the things your parents would tell you when you were growing up to scare you away from doing something? Like how lying might make your nose grow, misbehaving meant you wouldn’t get money from the tooth fairy, and swallowed chewing gum would build up in your stomach and stay there for years? Maybe that last one stayed with you well beyond your teens, and occurred to you every time you accidentally (or purposely) swallowed a piece of gum. We don’t blame you. It’s a scary thought. We hate to take the fun out of parental discipline, but swallowing a piece of chewing gum is pretty much like swallowing any other piece of food. It will move right through your digestive system with no danger of getting stuck for months, let alone seven years. This doesn’t mean you should start swallowing all your gum from now on, but if it happens accidentally now and then, there’s no need to panic. Another common gum myth is that sugar-free gum can help you lose weight. Although it is preferable to choose sugar-free gum over the extra-sweet variety, no studies have show that sugar-free gum will help you lose weight. If you pop a piece of gum in your mouth after dinner to avoid dessert, it could help you avoid eating a few extra calories every day. But the consumption of sugar-free gum without any other effort will not help you shed pounds. 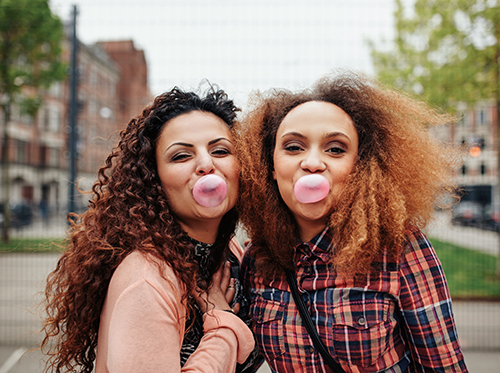 If you really enjoy chewing gum, we strongly encourage you to select sugarless gum, because it lowers your risk for cavities. Many brands of sugarless gum contain xylitol, a natural sweetener that can, in fact, help fight bacteria that cause cavities and rinse away plaque. So if you can’t kick the gum habit altogether, sugar-free is definitely the way to go! If you have any questions about chewing gum, feel free to contact Dr. Chris Boerger at our Fairfield, OH office.